Welcome to the concluding installment of my coverage of great Superman stories of the Bronze Age. Hope you enjoyed Part I and Part II. Last time, I covered some of Superman’s appearances in other character’s titles and in more esoteric formats (the treasury editions and book-and-record sets). I’ll wrap up here by covering Superman’s appearances in his more regular titles. First, I’m going to disqualify the solo Superboy title from this discussion, as well as the related Legion of Super-Heroes, both for the sake of simplicity and because Superboy had his own flavor (even if he is, technically, the same character as Superman). And honestly, most of Superboy’s solo stories during this era were nothing to write home about anyway. The Legion stories, however, present the opposite problem: There were a lot of great stories—so many, in fact, that they would hijack the column if included. And again, like the tales in Superboy, Legion had its own flavor. (For example, “The Great Darkness Saga” is one of my all-time favorites, and Superboy does play a role in it, but it’s clearly a Legion story, not a Superboy/Superman story.) It’s entirely possible I’ll get to the Legion in a column of its own some time at a later date. This brings us to Superman Family and World’s Finest, which were virtual wastelands, at least as far as the Superman stories were concerned. Some of the other features in these titles were interesting, but that’s obviously outside the scope of what I’m trying to cover in this particular column. Finally, for our purposes here, we should also probably leave out Justice League of America and Super Friends, since they’re team books and I want to stick to those titles where Superman was really the focal point. But oh, what the heck! Allow me to be self-indulgent here and offer up just one old favorite of mine from this category: Justice League of America #194 (cover date Sept. 1981) by Gerry Conway and the incomparable George Pérez. This issue pitted six Leaguers against one of their classic foes, Amos Fortune, who uses the Tarot deck as the basis for his scheme this time. Superman winds up facing “The Hermit,” who magically transforms him into an old man, while five other Leaguers are similarly attacked by Tarot-deck characters. When the League finally gets together and tracks down Fortune, he throws the “Death” card at them. In dramatic fashion, Superman shakes off the spell that aged him, turning back into his young, vigorous self, and punches Death in his smug, bony face—obliterating him/it in the process. I thought this was awesome when I first read it and find it just as awesome today. In the proper Superman solo books, Alan Moore’s stories—as mentioned way back in Part I—were fantastic. The tragedy is that there were far too few of them. “Whatever Happened to the Man of Tomorrow?” (from Superman #423 and Action Comics #583, both cover dated Sept. 1986) may be the greatest Superman story ever. In addition, Moore also wrote DC Comics Presents #85 (Sept. 1985, “The Jungle Line,” a team-up with Swamp Thing) and 1985’s Superman Annual #11 (“For the Man Who Has Everything”). All of these stories are fairly legendary at this point and are well known to most comic fans. For the few stragglers out there who may not have read them yet, you need to track them down immediately. 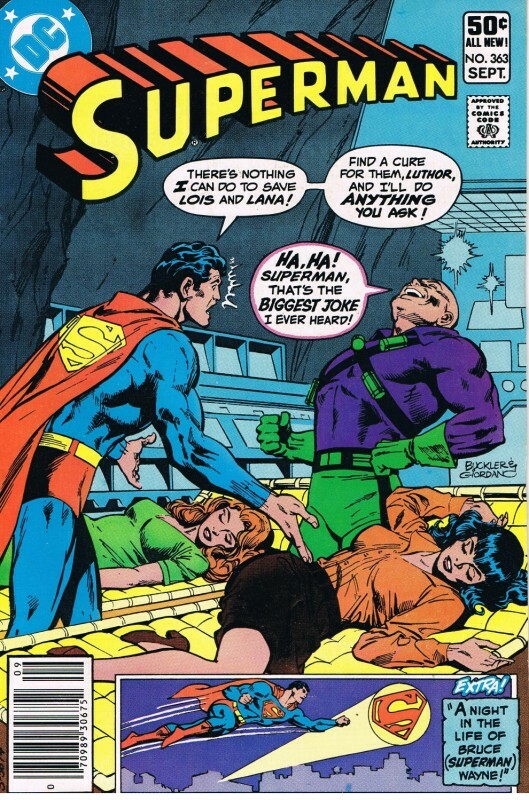 Superman #257 (Oct. 1972). I like this story because it’s good, simple fun all in a single issue. An alien being comes to Earth to steal all the nitrogen from the air, water, and soil. The alien carries a weapon that matches nearly all of Superman’s powers, forcing Supes to come up with a clever plan to defeat him. As mentioned in Part I, Curt Swan didn’t draw very snazzy aliens or tech, but his work here was okay. And the science is interesting without getting overly technical. The issue also featured a neat cover by the great Nick Cardy. Superman #260 (Jan. 1973). Another one-issue gem. This time Superman has to face “Valdemar of the Flame,” a mystically powered warrior who protects a magically hidden tribe of Vikings in a Maine valley. As mentioned back in Part I, the fantasy genre suits Swan’s talents perfectly and he does a great job here. Plus this issue’s got an even better Cardy cover than #257. Superman #287 (May 1975). Here’s where I reveal some of my own unique prejudices. This issue features Krypto the Super-Dog quite prominently and I just loved Krypto as a kid. (Probably because I loved dogs in general.) Krypto didn’t pop up in Superman’s titles that often in the Bronze Age, so Super-Dog fans have to savor this one. Superman #302 (Aug. 1976). This was a fun issue because Luthor uses his scientific genius against Superman in rather imaginative fashion: He makes Superman grow to giant size, but leaves his brain normal sized. Luthor refers to this as a “dinosaur” effect, wherein the body is large but the brain is a relative peanut. This affects Superman’s intellect as well as his ability to control his own body. Okay, so it’s not exactly Shakespeare, but I thought it was a clever premise. Superman #339–340 (Sept.–Oct. 1979). 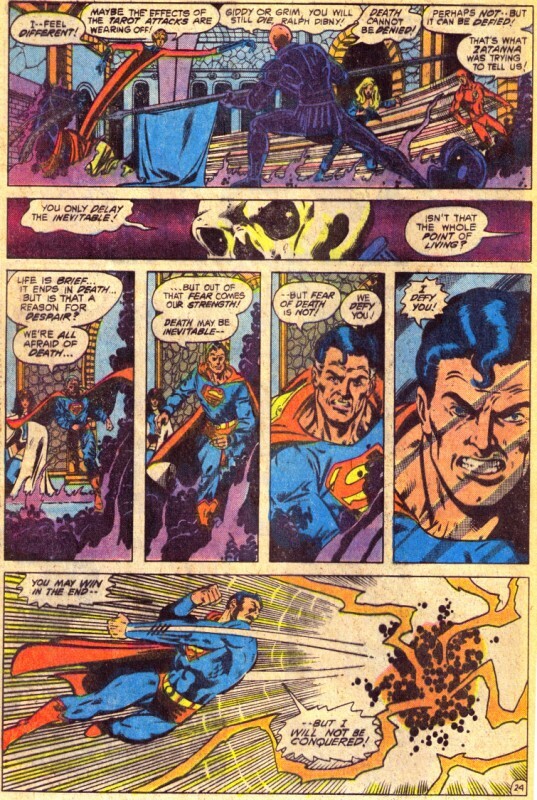 Superman fights a robot that has the consciousness of a bitter (and disturbed) human being trapped within it. This story was written by a Marvel expatriate (Len Wein) and thus feels like a more traditional Marvel-type story of compelling drama without some of the silliness burdening other Supes stories at the time. Superman #362–363 (Aug.–Sept. 1981). This may be Luthor’s finest hour as a character. It’s a two-parter that sees Lois Lane and Lana Lang struck by a strange disease for which Superman is unable to find a cure. By the time of the second part of this tale, Superman is so desperate that he actually reaches out to his arch-nemesis Lex Luthor for help. Not only does Luthor end up laughing in Superman’s face, he taunts the man of steel in a way that is beyond dastardly. After examining a microbe sample, Luthor brags that the odds of him developing a cure would be about 90 percent…if he chose to do so. But he won’t. Then he says that Superman could always compel him to do it by exposing him to the microbe, which would force Luthor to “save his own skin.” At this point he flings the sample toward the wall, forcing Superman to catch it before it breaks. That’s when Luthor starts laughing. This sequence perfectly demonstrates both Luthor’s cold-blooded evil and Superman’s unshakable morality. I think it’s masterfully done. Cary Bates did a splendid job writing this one. Superman #400 (Oct. 1984). The 400th anniversary issue of Superman was celebrated in rather unique fashion here. Instead of a conventional super hero story, we get what amounts to a sci-fi anthology issue (something right up the alley of editor Julie Schwartz). It’s a bunch of stories by different writers and artists showing how the legend of Superman will live on in future eras long after Superman has gone. The showcase of artists in this issue is particularly impressive—even the legendary Jim Steranko comes out of his self-imposed exile to make a contribution. Action Comics #460–463 (Jun.–Sept. 1976). Remember back in Part I when I mentioned how they did a poor job with some of the covers during this era? More specifically, how they would sometimes emphasize Clark Kent on the cover instead of Superman? Well the first two issues of this storyline are a perfect example of this. 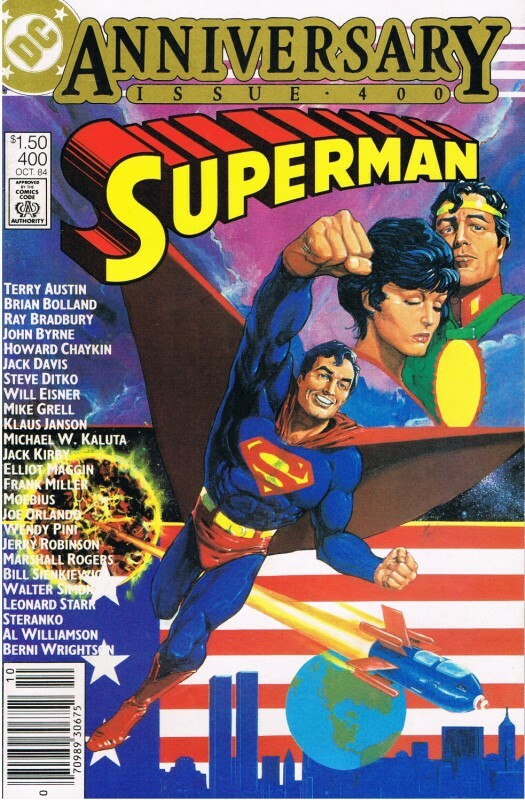 In the first two installments (460–461), Superman only appears on the cover as a poster on a wall while Clark Kent is emphasized. Between the covers, however, Cary Bates and Curt Swan do deliver a fun story. There’s an alien named Karb-Brak living in disguise on Earth because he developed a strange, deadly “allergy” toward the other members of his race back on his home planet. Things are going well until he sits next to the Clark Kent on a bus one day and suddenly his violent allergy returns. Turns out Kryptonians are too genetically similar to his own race, thus causing the reaction. In order to survive, Karb-Brak has got to get rid of Superman. Action Comics #464–466 (Oct.–Dec. 1976). Another Bates and Swan story, here Luthor’s scheme is to even the playing field with Superman by turning him into a little kid. Supes still has his super powers, but lacks the experience and maturity to use them wisely. Luthor uses the Flash and Batman as guinea pigs first, turning them into kids before trying it out on Superman. So even though “Superboy” still has the physical power to beat him, Luthor slaps him around and pretty much makes a fool out of him. Luthor really comes off as an awful bully, picking on a little kid. The young Flash and Batman try to help, but Luthor seemingly kills them(!) in combat. Supes is driven to tears at this, sobbing like a helpless child, which really tugs at the heart strings—which, in turn, makes it all the more exhilarating when Supes figures out it’s all really an elaborate mind-trick by Luthor, returns to adult form, and socks Luthor in the jaw. Action Comics #467 (Jan. 1977). Another great Krypto tale in the backup story of this issue, written by Bob Rozakis and penciled by Swan. Action Comics #510–512 (Aug.–Oct. 1980). Much like Superman #362–363, this is another great example of the depths of Lex Luthor’s evil, as he concocts a plot so insidious it boggles the mind. In order to carry out the ruse, Luthor brainwashes himself into believing he’s fallen in love with a woman and gone straight for her sake, all so he can use her as a human bomb, rigged to explode when Superman kisses her at their wedding reception! By Bates and Swan. Action Comics #515 (Jan. 1981). More Marvel expatriates make the scene, starting with a story here by Marv Wolfman. Marv and Gerry Conway would trade off for the next several months, each of them doing a couple issues at a time, until Marv took over completely, writing Action regularly for the next three-plus years. Action was generally a much better book during Marv’s tenure. 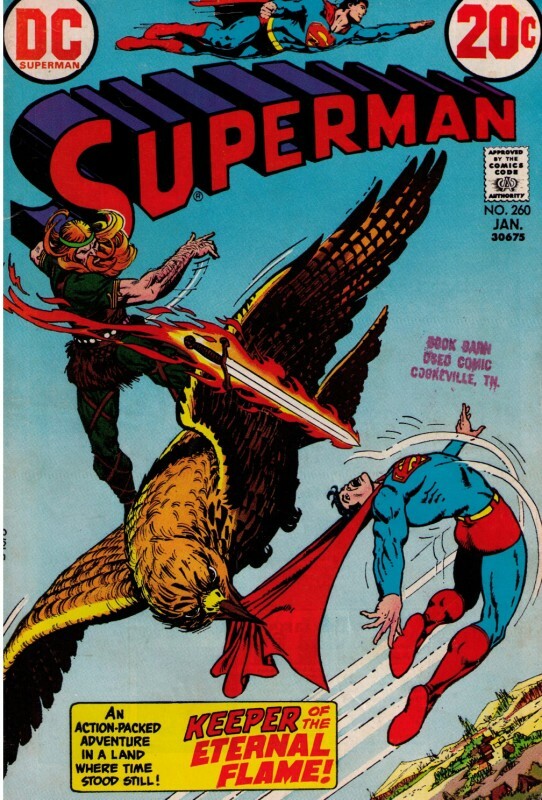 This issue features a battle with Vandal Savage, illustrated by Curt Swan. Action Comics #528–530 (Feb.–Apr. 1982). One of Brainiac’s creations runs wild and the android is forced to team with his old enemy, Superman, to stop it. The “planet destroyer”—a machine that absorbs all matter—is certainly a big enough threat to be worthy of Superman’s attention here. By Wolfman and Swan. Action Comics #534 (Aug. 1982). This kicks off a lengthy storyline (running through issue #541) where Superman sees his powers cut in half as he faces the magical menace of Lord Satanis and Syrene. By Wolfman with art by Gil Kane. Action Comics #544 (Jun. 1983). 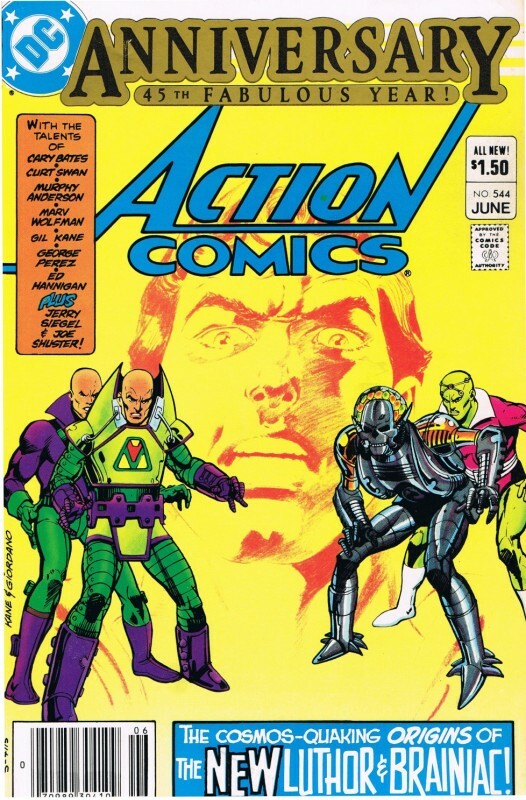 This is a giant-size issue celebrating the 45th anniversary of the publication of Action Comics #1 and features a redesign of both Luthor and Brainiac. 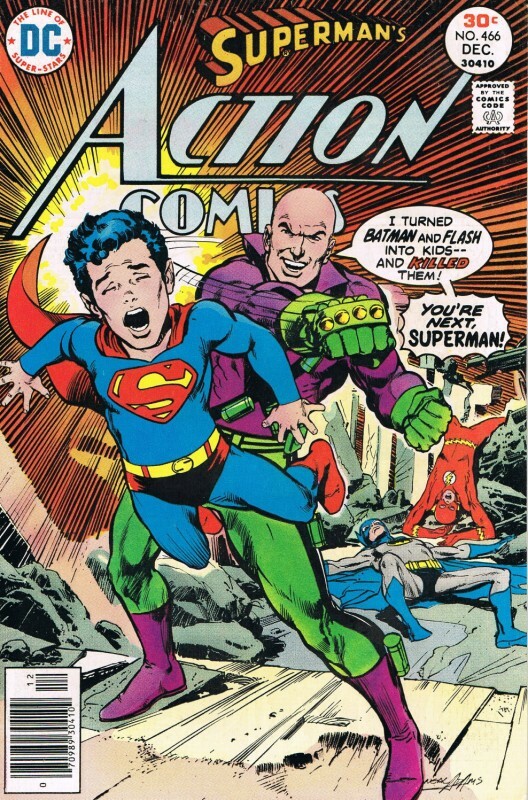 The Brainiac storyline here continues in the next two issues, culminating in a JLA-Teen Titans team-up in Action #546 (all by Wolfman and Kane), while the Luthor storyline gets picked up over in Superman (by Bates and Swan). 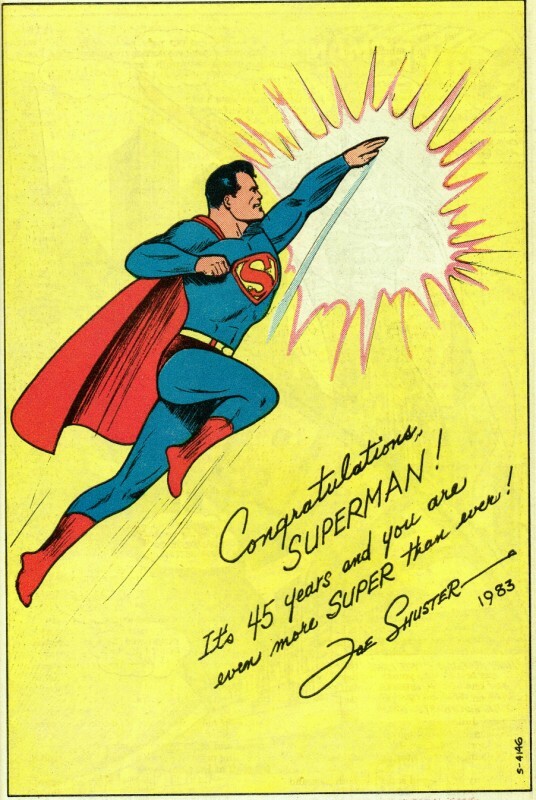 Action Comics #544: Joe Shuster’s last Superman drawing? More important than all this, however, is a text feature from Jerry Siegel and a pin-up by Joe Shuster, Superman’s creators. The pin-up might be the last Superman drawing Shuster ever did (he was already losing his eyesight at this point), and it’s really quite beautiful in its classic simplicity. Action Comics #552–554 (Feb.–Apr. 1984). This storyline kicks off with Superman meeting the “Forgotten Heroes” (characters from some of DC’s old titles of the late 50s and early 60s) and ends with the classic tale, “If Superman Didn’t Exist…” in #554—a loving tribute to Superman’s creators, Jerry Siegel and Joe Shuster. All by Wolfman and Kane. Finally, we have DC Comics Presents. This was Superman’s team-up title, and of all the regular Superman books of this era, DCP was probably the best in terms of batting average, giving us a lot more good stories than bad. Early issues of DC Comics Presents featured eye-popping art by a young José Luis García-López, as well as classic artists like Murphy Anderson. The stories weren’t always earth shaking, but they were consistently good, solid entertainment. Most of them were also one-issue stories—simple and light, like comfort food. The cream of the DCP crop, I think, would have to be the work of Jim Starlin. His four-issue run from issues 26–29 (Oct. 1980–Jan. 1981) begins with a Green Lantern team-up before transitioning into a three-part tale introducing Mongul and War World, and finally concludes in a confrontation with the omnipotent Spectre. In my opinion, Mongul and War World were the greatest additions to the Superman mythos in the entire Bronze Age. 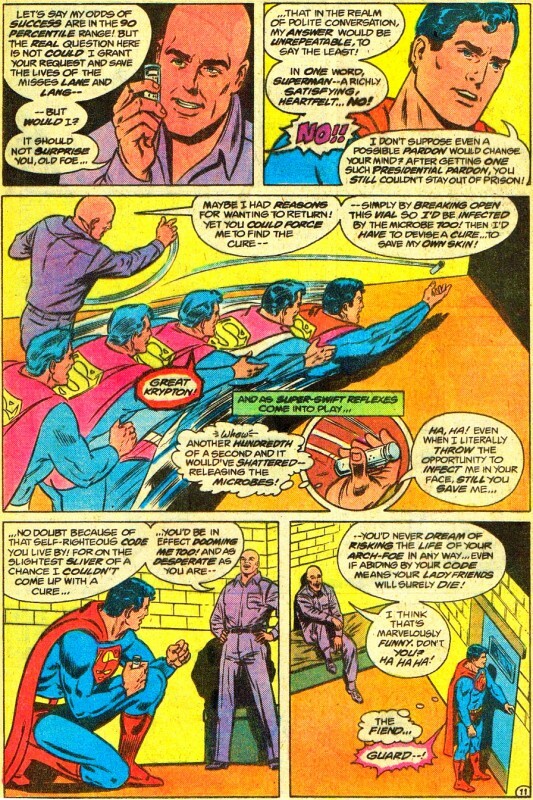 Starlin would then return in issue #36 (Aug. 1981), bringing Mongul back with him. This time, Supes would face him alongside the totally awesome Steve Ditko version of Starman. Starlin followed this up with an enjoyable team-up with Hawkgirl in issue #37 (Sept. 1981). DC Comics Presents #39 (Nov. 1981). A silly team-up with Plastic Man that warms my heart to this day. The gag at the end with Woozy Winks and his “Plastic Man signal watch” is just priceless. By Marty Pasko and Joe Staton. DC Comics Presents #41 (Jan. 1982). A team-up with the Joker to fight classic Superman foe the Prankster, by Pasko and José Luis García-López. DC Comics Presents #52 (Dec. 1982). A pairing with the Doom Patrol that features the first appearance of Ambush Bug. Script by Paul Kupperberg; pencils by Keith Giffen. DC Comics Presents #59 (Jul. 1983). Another comedy issue, this time with Supes and the Legion of Substitute Heroes vs. a returning Ambush Bug. By Paul Levitz and Giffen. DC Comics Presents #61 (Sept. 1983). Superman teams up with Omac (a personal favorite of mine) in a story drawn by George Pérez (an even bigger favorite of mine). Len Wein provides the script. DC Comics Presents #65 (Jan. 1984). A team-up with Madame Xanadu, with art by Gray Morrow. One of the best things about this whole series was how they’d get these legendary artists to parachute in and do a one-issue assignment like this. Many times, it would be the artist’s only brush with Superman (as was the case here, I believe). Script by Kupperberg. DC Comics Presents #66 (Feb. 1984). Superman meets Jack Kirby’s Demon, as illustrated by the magnificent Joe Kubert. Script by Wein. DC Comics Presents #77–78 (Jan.–Feb. 1985). The “Forgotten Heroes” return to help Supes out against the “Forgotten Villains.” By Wolfman and Swan. DC Comics Presents #84 (Aug. 1985). Superman teams up with another classic Kirby creation, the Challengers of the Unknown—this time with art by Kirby himself, as well as the superb Alex Toth. Script by Bob Rozakis. DC Comics Presents #97 (Sept. 1986). A story featuring the Phantom Zone villains written by Steve Gerber (yet another personal favorite) with art by Rick Veitch and Bob Smith. And that’s everything. (Unless I missed something. If I did, I’m sure someone will tell me in the comments.) Hope you enjoyed the ride as much as I did!